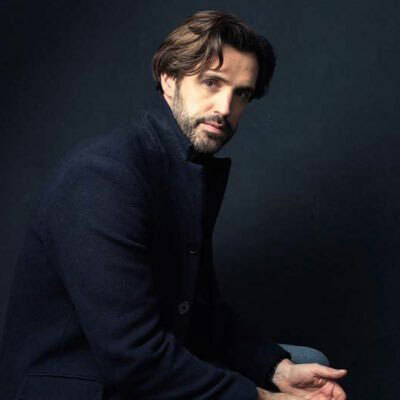 Andrew Lloyd Webber’s musical Sunset Boulevard is back on Broadway, starring Glenn Close, who originated the role of Norma Desmond 20 years ago, and two-time Olivier Award nominee, Michael Xavier as Joe Gillis. Xavier has been a mainstay in London’s West End starring in shows like Assassins, The Pajama Game and Into the Woods. With Sunset Boulevard, he’s making his Broadway debut and as he told me recently, when there was first talk of moving the show from London to New York, he originally thought it was just a “pipe dream.” When he finally heard the good news, from Close herself, he “jumped up and down,” he said. Xavier talks about his audition for the show, working with Glenn Close, keeping his voice in shape and the weirdest thing that’s ever happened to him on-stage. How did you find out the show was headed to Broadway? Michael Xavier: Well actually, it’s quite a funny story. I was on a tour a bus tour in LA going around famous people’s houses because the family that I was hanging out with wanted to do that. Glenn Close rang me when I was on the bus to say that we got it and I didn’t answer the phone because I thought, I can’t answer the phone on one of those tours and say, “Oh, excuse me, I’m just gonna answer the phone because it’s Glenn Close.” Because I thought there’s no way that they would believe me. And so I spoke to her a little bit later on and she said, “We’re going to Broadway” and I jumped up and down. Did you know or suspect the show would move to New York? Michael Xavier: Well, we talked to about it very early on at the sitzprobe in London. The producer said, “We have to take this to Broadway.” And Glenn put her arm around me there and then, in front of the producers, and said, “Well, I’m not doing it without him,” which was great. But I just thought it’s a pipe dream, it’s never gonna happen. Michael Xavier: Yes, I did have to audition. Michael Xavier: I auditioned in London. It was just one audition for Lonny Price. They filmed it and they sent it to Glenn and to Andrew Lloyd Webber and Don Black and Christopher Hampton for approval. But Lonny Price, the director, was actually sick with food poisoning and he left swiftly after my audition and I didn’t even realize it. It was only later on that I found out he was actually really ill. Maybe that’s why he chose me, his judgment was impaired. How is it working with Glenn Close? Michael Xavier: I mean she is The Glenn Close. She’s amazing. She so fantastic, she’s very generous, she’s very funny. It’s like having an acting master class every day I act opposite her and I’m learning so much from her. It’s not only a joy to be a colleague of hers but now a great friend. She’s wonderful in every way. It’s a dream come true. I know that sounds like a corny line to say but it’s such a dream come true to work with her. You’ve had so much success as an actor. Even now, do you ever find yourself standing back to watch someone like Glenn Close and try to take away some bits and pieces of the way she works? Michael Xavier: I learned a lot from watching her. As an actor, I’m always trying to learn constantly. Always trying to hone my craft. Even Glenn herself admits that her performance now is much more interesting and much more detailed than 20 years ago when she won the Tony for playing Norma Desmond. You’re constantly just trying to be better all the time and learning from Glenn it’s a great master class. Were you nervous the first time Andrew Lloyd Webber watched you in rehearsal? I know I’d be. Michael Xavier: Yeah, of course. I’d be crazy not to be nervous in front of the writer of the show but he was wonderful. He was so supportive and he loved it. I think the fear was that he wouldn’t love it and would say, “What the hell have we chosen this guy for?” But he was wonderful and very supportive and loved it from day one, so we were all very relieved and knew we had something quite special. Doing eight shows a week is hard on the voice, especially a role like yours when you’re on stage for most of the show. Would you do to keep in shape? Michael Xavier: I’ve got a very, very boring gym routine. I go to the gym six days a week. I get up every morning have my two coffees, go straight to the gym and have a good at least 45 minute workout. And it’s a very strict diet of limited amounts of sugar, I’m trying to cut out all refined sugar. So, the only sugar I get is from fruit. Which is, you know, pretty boring. I’m trying to cut out the carbohydrates as well. In turn, that actually helps the voice as well. It helps the sustainability of the voice. I do a lot of vocal exercises to keep my voice strong and make sure I warm up properly and warmed down. I steam, I’m sitting here with a steamer right now. I just finished the show and I just finished steaming. Was the weirdest thing that’s ever happened to you on stage? Michael Xavier: I’ve never answer this question. Normally, it’s what was the funniest thing that’s ever happened. But the weirdest thing was when in Love Story in London, which was a fantastic show. It didn’t last very long because it was badly publicized but was a really wonderful show written by the late Stephen Clark, God rest his soul. Directed by the brilliant Rachel Kavanaugh. And in the show, I’m told that my wife has leukemia and is going to be dying very soon. And the moment that the doctor delivers this news, one night this crazy person in the audience, this woman’s voice shouted out, “Kill her!” Which was to my and the doctors incredible surprise. We just kind of stared at each other and continued the show, we couldn’t quite believe it. So, that’s probably the weirdest thing that’s happened, the weirdest response from an audience certainly. Michael Xavier: I went for an audition for Mamma Mia, years ago. A long, long time ago. I was about 21, I think? And I walked into the audition room, having rehearsed what I was going to sing the night before. I sang it over and over and over again and didn’t understand much about the voice back then. I completely wore my voice out and then went to try and sing this really high song in front of a great casting director David Grinrod. I completely croaked my way through it. It was just a complete embarrassment. I squawked my way through it like a strangled parent. And almost before they could say, “Thank you, Michael,” I grabbed my sheet music off the piano and ran out the room in complete embarrassment. And then I ended up playing the role of Sky a few years later. So, I finally managed to pick the right audition material.